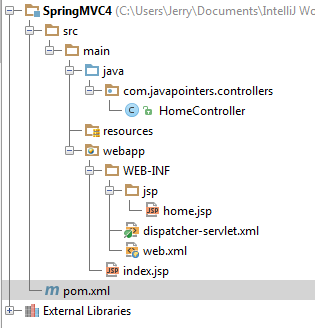 Share the post "How to create Spring MVC Project using Maven"
In this tutorial, we will be creating a simple Spring MVC Project using maven. Spring MVC is a popular framework when creating web applications. We will be using Spring MVC4 and Maven 3 in this post. In your pom.xml, add spring mvc dependencies. Under WEB-INF folder, create a file named dispatcher-servlet.xml. Open the file and copy the following code. <mvc:annotation-driven/> declares support annotation driven mvc such using @Controller, @Service, @Component. <context:component-scan base-package=”com.javapointers.controllers” /> means to scan classes from this base package to determine all bean classes. The view resolver specifies the locations of our views(jsp) and the extension. In your web.xml, add the spring configurations inside web-app section. Create a simple controller class that is inside your base package defined in dispatcher-servlet.xml. In this class, we have defined HomeController as a Controller class by @Controller annotation. We have also create a simple method that has a url mapping of “/home” with method GET. This means that when the user types the url /home in the browser, the request will be redirected to this method. This method return the string “home”. Using the ViewResolver defined in dispatcher-servlet.xml, the final location of the jsp will then be /WEB-INF/jsp/home.jsp. Under your WEB-INF folder, create a new folder named jsp. For security, our jsp files will be stored inside this folder. Hi! In my NetBeans Project i cant see web.xml file, i create “Configuration files” folder and this not appear in folders project, ¿What i can do to set up my spring – Maven Project?